LeoVegas Promotion: The world is in your hands! This promotion is no longer active, as the expiration date is exceeded! Spin the globe and pick your next destination as we dish out four trips worth €10 000 each, as well as unique chances to win prizes in our Casino and Live Casino every week! To participate in this promotion, make sure you have selected 'Yes' to offers, bonuses and communications in your account settings. Play our selected Promotion games for your chance at fabulous prizes such as Free Spins, cash, and one travel package worth €10 000 every week! Leo Tip: Deposit and wager €100 to qualify for all three tiers!" The world is in your hands" promotion period runs from 12:00 on Monday the 4th of February until 23:59 on Sunday the 3rd of March 2019. The time format in this document is CET. Gameplay outside the promotion period is not valid. Gameplay via any device (desktop, mobile, tablet) qualifies for this promotion. Only real money counts towards this promotion. Players qualify for this promotion by depositing and wagering the set amount of the Tier they wish to participate in. Wagering can be done on any Chambre Séparée table, as well as on any of the selected "Promotion games" slots: Sweet 27, Orient Express, Beauty and the Beast, Immortal Romance, Secret Romance, Fairy Gate, Deco Diamonds, Fairytale Fortune, Lucha Maniacs. Week 1: From 12:00 4/2 to 23:59 10/2. Week 2: From 00:01 11/2 to 23:59 17/2. Week 3: From 00:01 18/2 to 23:59 24/2. Week 4: From 00:01 25/2 to 23:59 3/3. To be eligible for the Tier 1 prizes, players need to deposit and wager €20 or more during the same promotional week. To be eligible for the Tier 2 prizes, players need to deposit and wager €50 or more during the same promotional week. To be eligible for the Tier 3 prizes, players need to deposit and wager €100 or more during the same promotional week. A player's deposits and wagers are accumulative during the promotional week. 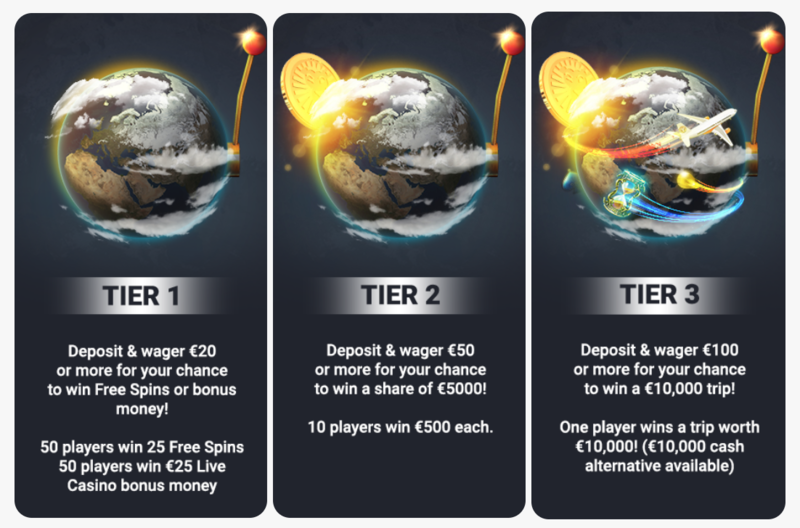 Meaning a player who has deposited and wagered €50 or more qualifies for Tier 1 and Tier 2. A player who has deposited and wagered €100 or more has qualified for Tier 1, Tier 2 and Tier 3. Max one prize per player per tier during one and the same promotional week. 100 winners are randomly drawn. Prizes are credited to winners accounts on the following Monday at 15:00. Free Spins have a wagering requirement of 35x. Bonus money has a wagering requirement of 70x. 10 winners are randomly drawn. 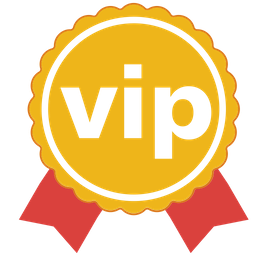 Prizes are credited to winners' accounts without wagering requirement within 48 hours after they have been published on the promotion winner page. One winner is randomly drawn. A cash alternative of €10 000 is available should the winner not want to or be able to accept the travel package. The winner will be contacted via phone within 72 hours after the promotional week has ended. Should the player opt for the cash alternative, the cash will be credited to the players LeoVegas account without wagering requirement within 48 hours. The winner needs to choose their desired destination, date of travel and duration of stay. LeoVegas will book according to availability and budget limitation. Restrictions apply to high risk destinations for safety purposes. The winner and their travel partner are responsible for acquiring the necessary travel documents and organising airport transfer in their home country. The travel package must be booked and used within 12 months. LeoVegas will contact travel package winners by telephone to request further travel details. If a winner cannot be reached within 72 hours, the prize will be re-raffled, and the winner will lose their right to the prize. If the flight is delayed or cancelled LeoVegas will provide no refund or compensation. Neither will there be compensation if the winner or their travel partner is unable to travel because of visa problems any other personal reason. The winner and their travel partner must sign a disclaimer, provided by LeoVegas, releasing LeoVegas from compensation for injuries or losses during the trip. All other expenses and unforeseen travel expenses, which are not explicitly mentioned in the description above, are the responsibility of the winner. This includes but is not limited to the following: other transportation, other meals, unforeseen expenses, passenger taxes/fees, additional taxes, airport charges, service charges, facility fees, personal expenses, security expenses, taxes or other expenses. Flights, hotel and activities depend on availability. The trips are subject to these terms and conditions as well as the terms stated by the airline, as shown on the ticket. Winners of the trip prize will be listed on the promotion's winner page after they have been contacted. Specific terms and conditions for the casino and live casino weekly mechanics are found on their respective promotional page. In order to be eligible to receive any of the listed components of this promotion, players need to select ‘Yes to Bonuses' and ‘Yes to Communications' in their profile settings. Any player who contravenes any of our Terms and Conditions and/or if LeoVegas reasonably suspects that a player has acted fraudulently and has abused the promotion, LeoVegas reserves the right to disqualify said player from the promotion and suspend/close the player's account. Should a player's account become closed for any reason during the promotion, they will automatically be withdrawn from participating in the promotion. Players must be 18 years or older and only have one membership account open with LeoVegas, as per the general terms and conditions found on site. Should LeoVegas discover a player with multiple accounts, all winnings will become null and void. It is the player's responsibility to ensure that it is legal for them to play at LeoVegas, in whichever jurisdiction they are gambling, and to take part in the promotion. LeoVegas reserves the right to change the terms and conditions and promotional material and structure relating to the promotion at our sole discretion and any decision with regard to the prizes offered to the players is final. These terms and conditions relate to this campaign only. General Terms and Conditions at LeoVegas apply. By participating in this promotion you accept to follow its Terms and Conditions. Promoter details: LeoVegas Gaming plc, The Plaza Centre, Bisazza Street, SLM 1640, Sliema, Malta.